If you have diabetes — especially Type 1 diabetes, or Type 2 diabetes that you manage with insulin or certain oral drugs that increase your body’s insulin production — you probably worry about hypoglycemia (low blood glucose). At best, hypoglycemia can be disorienting; at worst, it can be life-threatening. But does fear of hypoglycemia have any measurable effect on outcomes in people with diabetes? That’s the question researchers asked in a recent study involving young adults with Type 1 diabetes. Published last month by the Journal of Diabetes and Its Complications, the study had 35 participants with an average age of 26, all of whom used an insulin pump to control their diabetes. For the study, participants wore a continuous glucose monitor to record their blood glucose levels, as well as a physical activity monitor. They also kept a diary in which they rated their fear of hypoglycemia on a five-point scale every morning and evening. At the very beginning of the study, the participants completed a questionnaire on their daily food habits. At noted in a Healio article on the study, participants experienced hypoglycemia an average of once a day, which tended to last about an hour. This was seen both in their daily journals and their continuous glucose monitors, showing that participants were well aware of how often they experienced hypoglycemia. Experiencing a hypoglycemic event was associated with a higher level of fear of hypoglycemia in the evening, as shown in diaries — not exactly a surprising outcome. But the study also found that a higher level of morning hypoglycemia was associated with greater variability in blood glucose levels during the day. Evening fear of hypoglycemia was also associated with greater blood glucose variability the next day. Greater overall carbohydrate intake — this wasn’t measured on a daily basis — was also a factor in greater blood glucose variability. Fear of hypoglycemia was also associated with less physical activity, as measured by activity monitors. Overall, these results suggest that being afraid of hypoglycemia actually leads to worse blood glucose control and less exercise — possibly because of the effect that fear-induced stress has on the body. Of course, it would probably be unwise to have no fear of hypoglycemia at all — it’s a dangerous situation, and fear obviously plays some role in avoiding it. But this fear also has negative effects on blood glucose control, and it’s unclear what the long-term effects of this greater variability in levels might be. 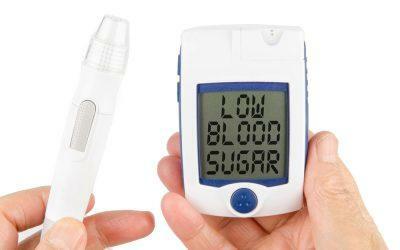 Do you experience fear of hypoglycemia regularly? If so, have you noticed any effect it has on your blood glucose levels — positive or negative? Have you found any good strategies for reducing fear, or your risk, of hypoglycemia? Leave a comment below!